PM Jens Stoltenberg: "There are many heroes during these last hours"
(CNN) -- On a rural island some 20 miles from Norway's capital, hundreds of young members of the country's Labour Party gathered each summer to discuss politics and democracy and enjoy each other's company. Utoya island, which can only be reached by boat, has been used by the Labour Party for its youth conference for decades, as well as a destination for family camping trips. All that changed Friday when a gunman dressed as a policeman went on a shooting rampage there, leaving at least 85 confirmed dead and many wounded of the roughly 600 people who'd been attending the camp -- most of them teenagers. Survivors of the attack told of running terrified through the tiny island's wooded areas, seeking a place to hide as the sound of gunshots rang out for well over an hour. Some tried to swim some 700 meters to safety on the opposite shore, Adrian Pracon, who was shot in the shoulder by the man, told CNN from a hospital in Norway. He was forced to turn back to Utoya after realizing he was exhausted and could not swim that far fully clothed. The gunman was waiting on the shore. "I was maybe 5 meters, maybe 7 meters away from him and he was yelling he was going to kill us all and we are going to die," Pracon said. "Then people started running around because they didn't know where to run." While the initial shots had been met with confusion and disbelief, he said -- especially as the man had claimed to be from the police -- that mood quickly turned to panic. "People were thinking, 'how can this happen at a summer camp in Norway?'" Now, as police divers undertake the grim search for bodies in the waters off the island, many will be asking the question: why did this happen here -- and was the Labour Party the target? The summer gatherings in Utoya for the party's youth wing, the Workers' Youth League, or AUF, have been part of a vibrant political tradition in the country since at least the 1970s, and enjoyed by many of those now in government. 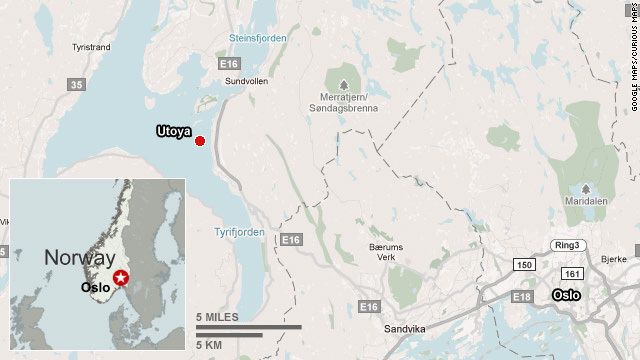 Prime Minister Jens Stoltenberg, himself a former AUF leader and Labour Party leader since 2002, was supposed to have attended the gathering in Utoya Saturday -- and had been to the island every summer since 1974. He told reporters the situation was even more painful because many of those who died had been friends and people he had known for many years -- and that he was devastated see a "paradise of my youth turned into hell" in the space of a few hours. "This is a place where I spent a lot of time as a young person, where I was politically active, where I started out on a political career. We have to regain this. Nobody's going to take this away from us." But asked if the Labour Party itself was a target, the prime minister said it was too early to comment on the motives behind the attacks on the island and in the capital, Oslo, where government buildings were hit by a huge explosion shortly beforehand. Seven people died and at least 90 were wounded, authorities said. Speaking after meeting survivors of the attacks and victims' families, Stoltenberg said he had heard dramatic accounts from some of the young people who had escaped the island massacre. One boy told how he swam to shore helping another who had been injured, the prime minister said. "In other words, he saved his friend's life as well his own. He is a hero and there are many heroes during these last hours." Sven Mollekleiv, president of the Norwegian Red Cross, told CNN it was doing its best to support those affected by the tragedy at Utoya. "We have now also mothers and fathers who don't know if their sons or daughters are alive. They are just waiting. And it's very important for our volunteers, trained people, to be there to talk to them," he said. Per Gunnar Dahl, a political adviser for the Labour Party, told CNN the shooting was "a huge tragedy" for the organization. "We are all deeply shocked and in deep, deep mourning for all the young people who have been both witnesses to this shooting and who were killed in this shooting and all the relatives of these young people," he said. "It has been a traditional camp where young people have met and discussed politics and many, many of our leaders have participated on Utoya for many years. "Some of the brightest and best politicians Norway has brought up have been a part of that island and the history of that island, since the camps have gone back for so many years." Labour Party member Bjorn Jarle Roberg-Larsen told CNN the vast majority of the youth movement attendees were between the ages of 16 and 22, though some were as young as 13 and others as old as their early 30s. They had been planning to attend political training classes and participate in group activities during the day and sleep in tents at night, he said. The summer camp was an institution for the Labour Party's young followers, Foreign Minister Jonas Gahr Store told CNN. "The kids that have gone there have been looking forward to it, qualifying for it," he said. "It has been about politics and joy." This turned into a "terrible, terrible moment" for the young people there Friday, he said. Speaking to reporters later, Store added: "I think what we have seen today is that politically motivated violence poses a threat to society and I commend the police for carrying out a very swift and effective investigation, but that is still ongoing." Despite the attack, Eskil Pedersen, leader of the Norwegian Labour youth movement, said the camp will persevere. "Our summer camp has always been a great event. Many people have learned so much and gotten many friends. Then we were struck by tragedy. We will continue to work hard (for) our organization in memory of those we lost," Pederson told reporters Saturday. Norway's prime minister echoed that message after meeting with survivors of the Utoya attack. "They say the best way in which we can honor those who have lost their lives is to carry on being politically active," Stoltenberg said. "We must take control of Utoya and show that young people can be engaged, that young people are interested in society and debating politics, and show that those people who want to scare us will not win." CNN's Diana Magnay contributed to this report.